Airway Surface Liquid (ASL) physiology in health and how it fails in major airways diseases, e.g. the “dehydration hypothesis as relates to CF” (Figure 1). Airway epithelial Na+ transport, including studies of normal regulation of airway epithelial Na+ transport, and role of Na+ transport in airways disease, including mouse models over-expressing subunits of the epithelial Na+ channel (ENaC) (Figures 2, 3). Extracellular nucleotides and their role in airways homeostasis, including the role of P2 receptors in airway epithelial function, extracellular nucleotidases; and measuring the rates of metabolism of nucleotides and nucleotide release from cells. Gene therapy for CF lung disease, particularly focusing on investigations of barriers to gene transfer, and improved vector targeting. Clinical studies: a current area of interest focuses on Na+ channel blockers and hypertonic saline (Figures 4-6). Fig 1. 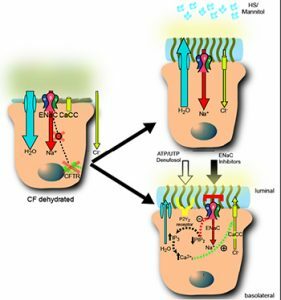 CF Airways Disease: The “Dehydration” Hypothesis. Annual Review of Medicine, 2007. Fig 2. The βENaC Mouse Model: A Phenocopy of CF Lung Disease. Nature Medicine, 2007. Fig 3. Survival Curves and Causes of Death of Scnn1b (βENaC) Mice. Nature Medicine, 2004. Fig 4. CF Produces Heterogeneous Structural and ‘Basal’ Mucus Clearance Lung Defects. 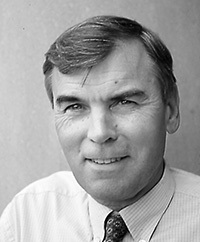 NEJM, 2006. Fig 5. Therapeutic Strategies to Rehydrate CF Airway Surfaces. Curr Opin Pharm, 2010. Fig 6. 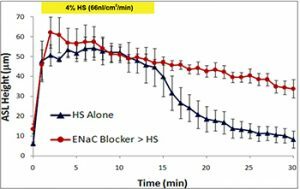 Airway Surface Liquid Height in Human Bronchial Epithelial Culture Response to Aerosolized Hypertonic Saline +/- Long-Acting Na+ Channel Blocker. Abdullah LH, Coakley R, Webster MJ, Zhu Y, Tarran R, Radicioni G, Kesimer M, Boucher RC, Davis CW, Ribeiro CMP. Mucin production and hydration responses to mucopurulent materials in normal vs. CF airway epithelia. Am J Respir Crit Care Med. 2018 Feb 15;197(4):481-491. doi: 10.1164/rccm.201706-1139OC. PMID: 29099608. PMCID: PMC5821906. Livraghi-Butrico, A., Wilkinson, K.J., Volmer, A.S., Gilmore, R.C., Rogers, T.D., Caldwell, R.A, Burns, K.A., Esther, C.R. Jr., Mall, M.A., Boucher, R.C., O’Neal, W.K., Grubb, B.R. Lung disease phenotypes caused by overexpression of combinations of α-, β-, and γ-subunits of the epithelial sodium channel in mouse airways. Am J Physiol Lung Cell Mol Physiol.2018 Feb 1;314(2):L318-L331. doi: 10.1152/ajplung.00382.2017. PMID: 29074490. PMCID: PMC5866504. Yu D, Saini Y, Chen G, Ghio AJ, Dang H, Burns KA, Wang Y, Davis RM, Randell SH, Esther Jr CR, Paulsen F, Boucher RC. Loss of βENaC function in meibomian glands produces pseudohypoaldosteronism 1-like ocular disease in mice. Am J Pathol. 2018 Jan;188(1):95-110.doi: 10.1016/j.ajpath.2017.09.016. PMID: 29107074. PMCID: PMC5745530. Donoghue LJ*, Livraghi-Butrico A*, McFadden KM, Thomas JM, Chen G, Grubb BR, O’Neal WK, Boucher RC, Kelada SNP. Identification of trans protein QTL for secreted airway mucins in mice and a causal role for Bpifb1. Genetics. 2017 Oct;207(2):801-812. doi: 10.1534/genetics.117.300211. PMID: 28851744. PMCID: PMC5629340. Adams DC, Pahlevaninezhad H, Szabari MV, Cho JL, Hamilos DL, Kesimer M, Boucher RC, Luster AD, Medoff BD, Suter MJ. Automated segmentation and quantification of airway mucus with endobronchial optical coherence tomography. Biomed Opt Express. 2017;8(10):4729-4741. doi: 10.1364/BOE.8.004729. PMID: 29082098. PMCID: PMC5654813. Kesimer M, Ford AA, Ceppe A, Radicioni G, Cao R, Davis WC, Doerschuk CM, Alexis NE, Anderson WH, Henderson AG, Barr G, Bleecker ER, Christenson SA, Cooper CB, Han MLK, Hansel NN, Hastie AT, Hoffman EA, Kanner RE, Martinez F, Paine R, Woodruff PG, O’Neal WK, Boucher RC. 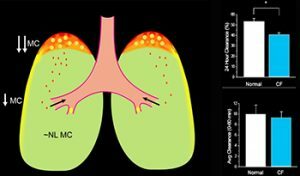 Airway mucin concentration as a marker of chronic bronchitis. N Engl J Med. 2017 Sep 7;377(10):911-922. doi: 10.1056/NEJMoa1701632. PMID: 28877023. PMCID: PMC5706541. Sandefur CI, Boucher RC, Elston TC. Mathematical model reveals role of nucleotide signaling in airway surface liquid homeostasis and its dysregulation in cystic fibrosis. Proc Natl Acad Sci U S A. 2017 Aug 29;114(35): E7272-E7281. doi: 10.1073/pnas.1617383114. PMID: 28808008. PMCID: PMC5584404. Woodruff PG, van den Berge M, Boucher RC, Brightling C, Burchard EG, Christenson SA, Han MK, Holtzman MJ, Kraft M, Lynch DA, Martinez FD, Reddel HK, Sin DD, Washko GR, Wenzel SE, Punturieri A, Freemer MM, Wise RA. ATS-NHLBI Asthma COPD Overlap (ACO) workshop report. Am J Respir Crit Care Med. 2017 Aug 1;196(3):375-381. doi: 10.1164/rccm.201705-0973WS. PMID: 28636425. PMCID: PMC5549872. Esther CR Jr, Hill DB, Button B, Shi S, Jania CM, Duncan EA, Doerschuk CM, Chen G, Ranganathan S, Stick SM, Boucher RC. The sialic acid to urea ratio as a measure of airway surface hydration. Am J Physiol Lung Cell Mol Physiol. 2017 Mar 1;312(3):L398-404. doi: 10.1152/ajplung.00398.2016. PMID: 28062483. PMCID: PMC5374301. Livraghi-Butrico A, Grubb BR, Wilkinson K, Volmer AS, Burns KA, Evans C, O’Neal WK, Boucher RC. 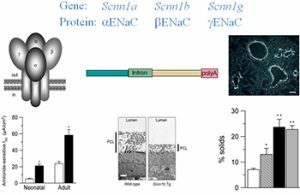 Contribution of mucus concentration and secreted mucins Muc5ac and Muc5b to the pathogenesis of muco-obstructive lung disease. Mucosal Immunol. 2017 Mar;10(2):395-407. doi: 10.1038/mi.2016.63. PMID: 27435107. PMCID: PMC5250616. Zeman KL, Rojas Balcazar J, Fuller F, Donn KH, Boucher RC, Bennett WD, Donaldson SH. A trans-nasal aerosol delivery device for efficient pulmonary deposition. J Aerosol Med Pulm Drug Deliv. 2017 Aug;30(4):223-9. doi: 10.1089/jamp.2016.1333. PMID: 28157412. PMCID: PMC5564034. Saini Y, Wilkinson KJ, Terrell KA, Burns KA, Livraghi-Butrico A, Doerschuk CM, O’Neal WK, Boucher RC. 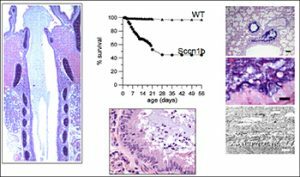 Neonatal pulmonary macrophage depletion coupled to defective mucus clearance increases susceptibility to pneumonia and alters pulmonary immune responses. Am J Respir Cell Mol Biol. 2016 Feb;54(2):210-21. doi: 10.1165/rcmb.2014-0111OC. Epub 2015 Jun 29. PubMed PMID: 26121027. PubMed Central PMCID: PMC4821038. Lubamba BA, Jones LC, O’Neal WK, Boucher RC, Ribeiro CM. X-box binding protein 1 modulates innate immune responses of cystic fibrosis alveolar macrophages. Am J Respir Crit Care Med. 2015 Dec 15;192(12):1449-61. doi: 10.1164/rccm.201504-0657OC. Epub 2015 Sep 2. PubMed PMID: 26331676. PubMed Central PMCID: PMC4731720. Ghosh A, Boucher RC, Tarran R. Airway hydration and COPD. Cell Mol Life Sci. 2015 Oct;72(19):3637-52. doi: 10.1007/s00018-015-1946-7. Epub 2015 Jun 12. PubMed PMID: 26068443; PubMed Central PMCID: PMC4567929. Anderson WH, Coakley RD, Button B, Henderson AG, Zeman KL, Alexis NE, Peden DB, Lazarowski ER, Davis CW, Bailey S, Fuller F, Almond M, Qaqish B, Bordonali E, Rubinstein M, Bennett WD, Kesimer M, Boucher RC. 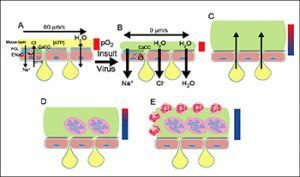 The relationship of mucus concentration (hydration) to mucus osmotic pressure and transport in chronic bronchitis. Am J Respir Crit Care Med. 2015 Jul 15;192(2):182-90. doi: 10.1164/rccm.201412-2230OC. PubMed PMID: 25909230; PubMed Central PMCID: PMC4532825.